This CellML model is known to run in both OpenCell and COR and the units have been checked and are consistent. The model recreates the published results. ABSTRACT: We have developed a single-compartment, electrophysiological, hypoglossal motoneuron (HM) model based primarily on experimental data from neonatal rat HMs. The model is able to reproduce the fine features of the HM action potential: the fast afterhyperpolarization, the afterdepolarization, and the medium-duration afterhyperpolarization (mAHP). The model also reproduces the repetitive firing properties seen in neonatal HMs and replicates the neuron's response to pharmacological experiments. The model was used to study the role of specific ionic currents in HM firing and how variations in the densities of these currents may account for age-dependent changes in excitability seen in HMs. By varying the density of a fast inactivating calcium current, the model alternates between accelerating and adapting firing patterns. Modeling the age-dependent increase in H current density accounts for the decrease in mAHP duration observed experimentally, but does not fully account for the decrease in input resistance. An increase in the density of the voltage-dependent potassium currents and the H current is required to account for the decrease in input resistance. These changes also account for the age-dependent decrease in action potential duration. A schematic diagram of the cell model. 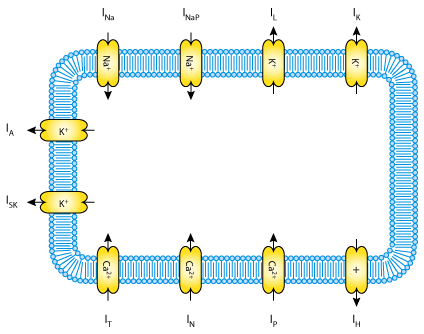 It is composed of ten ionic currents across the plasma membrane: a fast sodium current, INa; a delayed rectifier potassium current, IK; a persistent sodium current, INaP; a passive leakage current, IL; a LVA calcium current, IT; an N-type HVA calcium current, IN; a P-type HVA calcium current, IP; a calcium-dependent potassium current, ISK; a fast-transient potassium current, IA; and finally, a hyperpolarisation-activated current, IH. Derived from workspace Purvis, Butera, 2005 at changeset 10d8c5c11fa8.